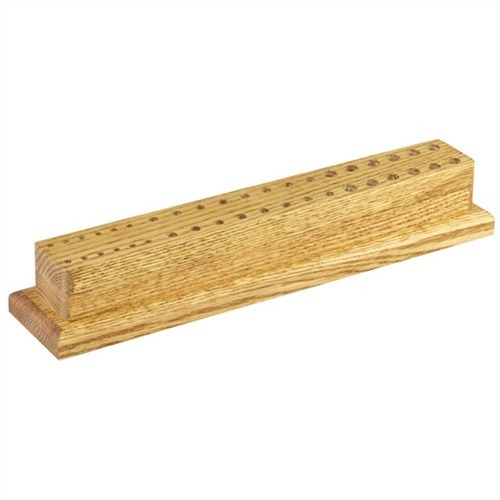 Compact, tough, solid oak block has 40 holes drilled along the top to hold punches, small screwdrivers, palm chisels, needle files, gravers, pencils, scribes right where they're always handy. Frees up tool box space. Designed by a gunsmith for use on his own bench, and shared with us because it's such a great tool holder. SPECS: 15" (38.1cm) long, 3" (7.6cm) wide, 2¼" (5.7cm) high. 12 holes 7/16" (11.1mm) diameter; 16 holes 9/32" (7.1mm) diameter; 12 holes 3/16" (4.8mm) diameter. All holes 1¼" (3.2cm) deep. Kompakt, tøff, solid eik blokk har 40 hull boret øverst holder slag, små skrutrekkere, palm meisler, p filer, gravers, blyanter, skriftlærde akkurat der de er alltid nyttig. Frigjør verktøyet boksen plass. Designet av en gunsmith for bruk på sin egen benken, og delte med oss fordi det er slik en stor verktøyet holder. Spesifikasjoner: 15"(oppe i 38,1 cm) lang, 3" (7.6 cm) bred, 2¼"(5.7 cm) høy. 12 hull 7/16" (11.1 mm) diameter, 16 hull 9/32"(7.1 mm) diameter, 12 hull 3/16" (4.8 mm) diameter. Alle hull 1¼"(3.2 cm) dyp. A [$], solid, sturdy, Oak P&NF block, with average finish, but many of the holes were NOT completely drilled through and needed the customer to clear them. I liked this block so much, I bought two of them to hold all my various random sized tools. This block is excellent for sticking things like punches, picks, pens, scissors and so on in that don't normally have a home. Or, rather than dumping them into a drawer, they're held neatly and within reach. I found the finish to be quite nice on both units. The holes were drilled nicely, and there was no burs remaining in the holes. It looks like oak to me. It has a medium brown stained color and is nicely finished in polyurethane. It has felt feet on the bottom and a Brownells logo engraved on the front. Extremely happy with this item. Punch/File Bench Block Kompakt, tøff, solid eik blokk har 40 hull boret øverst holder slag, små skrutrekkere, palm meisler, p filer, gravers, blyanter, skriftlærde akkurat der de er alltid nyttig. Frigjør verktøyet boksen plass. Designet av en gunsmith for bruk på sin egen benken, og delte med oss fordi det er slik en stor verktøyet holder.